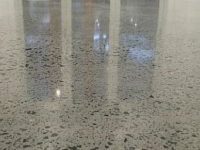 The Water Based Sealers range make very effective polished concrete sealers. Their nano sized polymers penetrate deep into the substrate and form an acrylic co-polymer matrix throughout the top layers of the concrete. This matrix remains for the life of the concrete, but the outer wear layer should be replenished with a maintenance coat every 3-5 years depending on traffic. 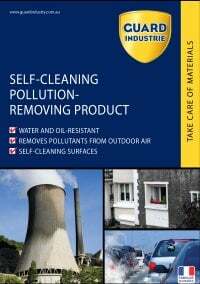 All these products are water based, environmentally friendly and safe to use. They contain no VOC’s and therefore are a safe option for sealing internal floors. 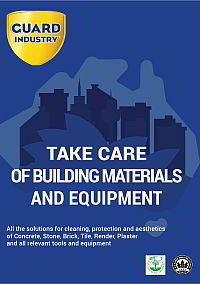 All these products can be applied to wet or damp surfaces. 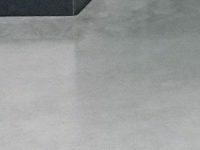 They are also UV stable and breathable so they will outlast most other polished concrete sealers in outdoor applications. 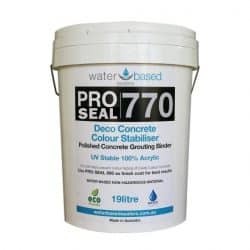 Use Pro Seal 770 as a binder for wet grouting applications. It will bind fines from the slab together to fill all fine cracks, pin holes and voids. It can either be ground to a creamy consistency and squeegeed off or worked until dry and cutback. 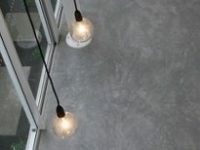 Seal honed concrete with a two-stage sealing system of Pro Seal 770 followed by Pro Seal 896. The Pro Seal 770 will subtly enhance the colours and reduce the substrate porosity. The Pro Seal 896 top coat will add increased strength and stain repellency. 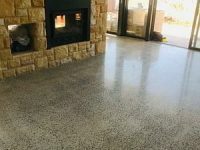 ProSeal 896 can be used as a stand alone sealer for honed concrete. It will not significantly darken the surface and will leave a satin finish. This product makes the stone pop out as it will add shine and colour without significantly altering the cement. 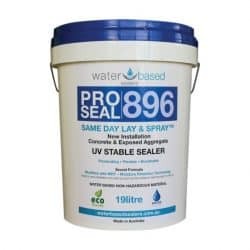 For highly polished concrete surfaces seal with Pro Seal 898. 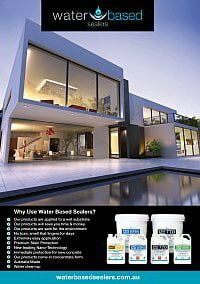 It has the smallest individual molecule size of the Water Based Sealers range and is designed to penetrate into really dense surfaces that are usually very difficult to effectively seal. The level of gloss produced by both Pro Seal 896 & Pro Seal 898 depend mostly on the finish of the surface to which they are applied. As true Nano sealers they will leave a very fine layer that will conform tightly to the existing contours. Application of additional coats will build on the surface film and thereby increase the level of gloss. Both products can be buffed to achieve very high gloss levels. ProtectGuard HD is a full penetrating sealer which leaves the concrete looking completely natural. It is highly hydrophobic and oleophobic so water and oils will bead on the surface. It possesses excellent stain resistant properties and has an effective service life of more than 10 years in most flooring applications. Since it leaves no surface film grip levels of the surface are not compromised and therefore it is a good solution for pool areas and public open spaces. 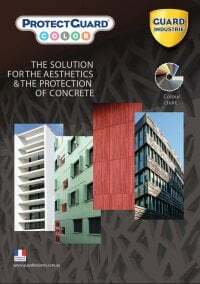 ProtectGuard HD is very breathable and therefore is very good in external applications. For highly polished surfaces consider using ProtectGuard MG Eco. 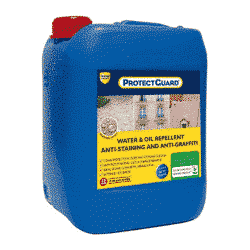 It performs the same as ProtectGuard HD but is formulated to penetrate better into dense surfaces. ProtectGuard Wet Finish Premium is a penetrating polysiloxane sealer. It produces an intense darkening of the concrete similar to a wet slab. Since it is penetrating it is possible to get a low sheen but darkened finish. Additional coats can be applied to achieve higher gloss levels if desired, however, this will reduce breathability. ProtectGuard WF Premium contains an alcohol based solvent, but still achieves an A+ for emissions into indoor air.